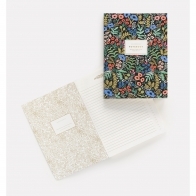 Great journal Tapestry from Rifle Paper Co. Notebook with black cover with colorful flowers. The company officially launched via riflepaperco.com in November 2009. What began as a small business based out of Anna and Nathan's garage apartment has quickly grown into an international brand over the last six years. Rifle Paper Co.'s roots are in stationery, but as we continue to grow and develop more products under the Rifle Paper Co. brand, we look forward to expanding the breadth and depth of our product line. We've also collaborated with partners like LeSportsac, Garance Doré, Paper Crown, Puffin Books, Tattly and Paperless Post, to name a few.